One of Mount Washington’s premier rock routes, the West Ridge is one of the most sustained routes on the mountain. We will approach our climb following the Pacific Crest Trail for several miles, before utilizing climber’s trails as we head towards the West Ridge. Once we transition into our rock shoes the climber can look forward to 6 to 8 pitches of technical rock up to 5.8 in difficulty. There are exposed positions on the ridge with sweeping views down either side. After soaking up the dramatic 360 degree views we’ll head down the North Ridge route, eventually returning to the Pacific Crest Trail for our hike out. Climbers must be physically prepared for a long day in the mountains. We are able to schedule this program Monday through Thursday between Memorial Day and Labor Day, because of limitations on all commercial permits in the Deschutes-Willamette National Forest. 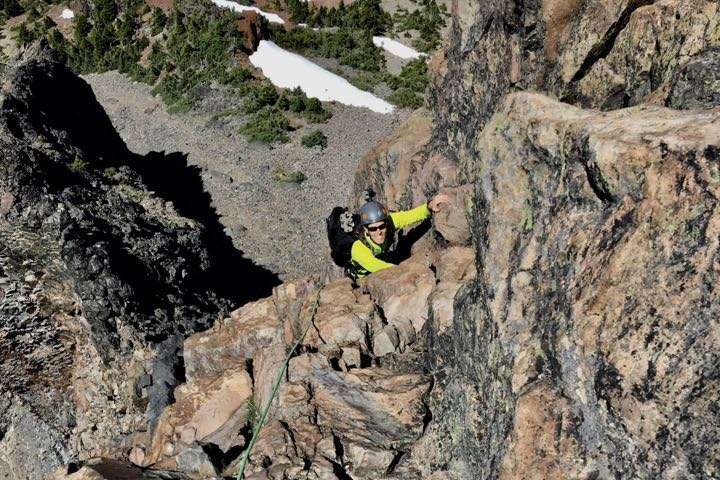 The West Ridge of Mount Washington has several challenging pitches of crack climbing, interspersed with knife-edge ridge traversing, on moderate and engaging rock. This is a full day with a 6 mile approach on the Pacific Crest Trail as well as established climbers trails. Join us at Smith Rock Climbing School to push your rock climbing grades and seek out multipitch routes.